It is also used for dizzy head and headache if these are related to blood vacuity. Welling- and flat-abscesses and sores are also mentioned as indications. Since the properties of Chinese angelica root are extensively described in English literature elsewhere, this is just a summary. Note that compared to 當歸 [dāngguī] – Chinese angelica root, 歐當歸 [Ōudāngguī] is relatively weak in medicinal action. A monograph in English on lovage can be found in ‘The Energetics of Western Herbs – A Materia Medica Integrating Western and Oriental Herbal Medicine Traditions’ by Peter Holmes. In the second edition, the index page number is 175 but I found it on page 185. In Holland this widely grown vegetable garden plant is called maggiplant (Maggikraut in Germany and Maggichrut in Switzerland). I knew ‘maggi’ before I knew the plant because we had it on the dinner table (in a silver container that was specially designed for those bottles, similar to the one in the picture below) whenever we ate soup. As a liquid seasoning mix it came in a dark brown bottle with Maggi as brandname. My mother also always kept Maggi cubes in the kitchen to add to home-made soups. The original German name (before its association with the seasoning products with the brandname Maggi) is Liebstöckel, and in Dutch the other common name is lavas. Italian: levistico or sedano di monte; French: livèche; Romanian: leuştean; Hungarian: lestyán; Russian: любисток lyubeestok. In Bulgaria, it is known as девесил deveseel. The Czech name is libeček, and the Polish name is lubczyk, both meaning ‘love herb’. The name in Swedish is libbsticka; Norwegians say løpstikke. The Croatian name for this plant is ljupčac or vegeta (named after a well-known Croatian meal seasoning similar to Maggi). 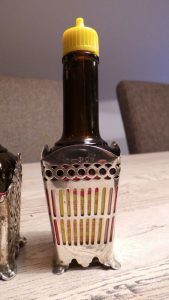 The Finnish name is liperi or lipstikka, the former meaning ‘preacher’s collar’, because in old ages the plant was cultivated in monasteries or in rectories, while the latter is from Swedish. 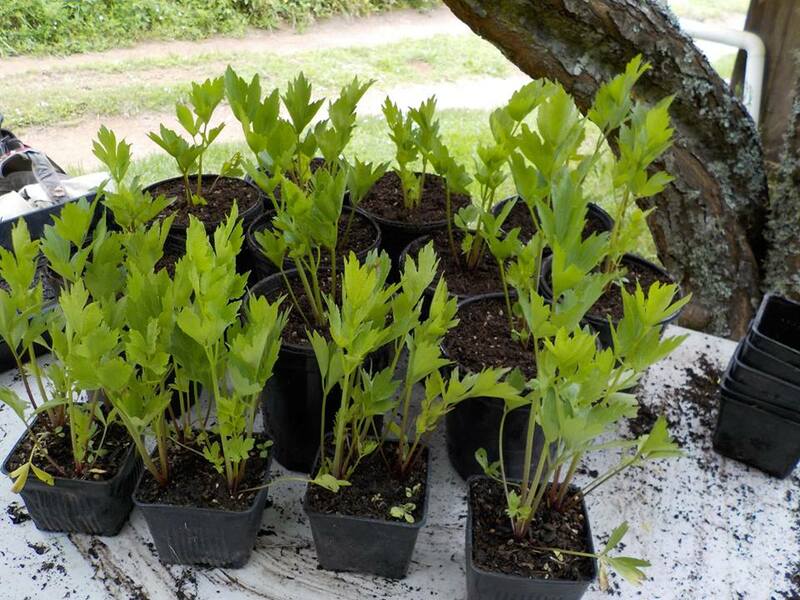 I have noticed that lovage is not widely known among gardeners in the U.S. of A., and since I also discovered its use in Chinese medicine, I decided to grow it in an amount that enables me to give it as a present to garden- and herbal medicine friends in America. I sold some at farmers’ markets as well. In the pictures you see the plants during the second potting in late spring. The seeds were planted in january. It is a perennial plant and it is wise to give it some space as it can grow quite large. For many gardeners it is a must to have one or two in the vegetable garden. After one or two seasons you can dig up the plant, split the roots and replant. For medicinal use of the root, leave it in the ground for a couple of years. Wat ziet dit er top uit. Gaaf man. Het ouderwetse maggi flesje, ik zie het nog staan. Ik heb er fotoos bijgezet. Dacht ineens aan die zilveren houder! Dank voor je feedback! (ik heb mijn brief bijna af).